After lawmakers, Senator Antonio Trillanes IV who claimed that the six-month closure of the island was done in order to hasten the construction of the Casino in Boracay island and Bayan Muna party list Representative Carlos Isagani Zarete who filed House Resolution No. 1806 that will obligate committees on natural resources and ecology to have the jurisdiction to stop environmentally-harmful actions on the island, the Malacañang finally slammed the requests of these two to investigate President Rodrigo Roa Duterte’s orders on closing the island down because the government never allowed the construction of the casino resort in the first place. Zarete vents worries on the capacity of the island that has long been exceeded since 2009. He quoted numbers from the Department of Environment and Natural Resource, being that in 2009, there were on average, 9,362 tourists everyday while in today, it’s at 14,182 tourists daily. Considering that the island was home to tens of thousands of employees and locals, a huge number of tourists and the fact that the island is an estimated 7km by 2km in length and width, which makes it severely overpopulated. And Zarete found Duterte, considering that his and Trillanes claims were true, to be “ironic and intriguing” since the closure was supposed to be for the islands rehabilitation yet the casino’s construction would do the complete opposite. Yet Duterte made it clear that he is opposed to the casino’s construction in Boracay for he wants to convert the island into a land reform area after the six-month rehabilitation. 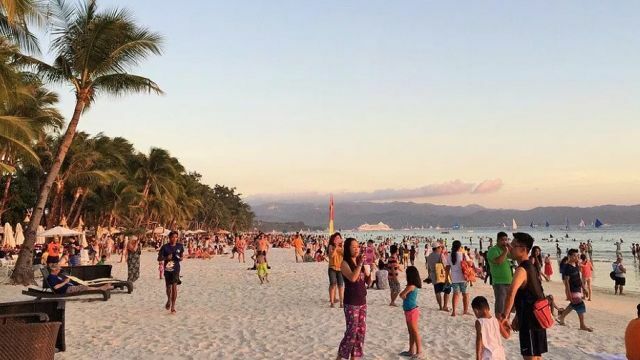 “Boracay closed to tourists and no casinos in Boracay. Period,” Roque said.